The progress Lamar Jackson has achieved in his career cannot be overemphasized. Even as an influential college footballer who is best known for his rare speed, mind-blowing passing and best-skilled quarterback, Lamar has not failed his fans in keeping up at his best in the football field. One of the key tactics that this Baltimore Ravens’ quarterback for the NFL uses to defeat his opponent in the field is his Processing speed and decision-making. Jack’s rare athletic trait could make a game slow down just so he would make those moves like a flashlight before anyone else realises it. He is one of those players who’s got a lot of confidence in their playmaking abilities and that is why he is able to achieve so much in a very short time. There is definitely more to know about Baltimore Ravens quarterback than being one of the finest and most talented college footballers in the world. Born on January 7, 1997, Lamar Demeatrice Jackson Jr. is a native of Pompano Beach, Florida. He is best known for playing college football for the Louisville but he had his high school education at Boynton Beach High School which is located in Boynton Beach, Florida. Lamar is a son to Lamar senior, his father who died by a car accident, and Felicia Jones, his mother who raised him as a single mother. Seeing how passionate he is with the American football even at his very young age of about eight years, his mother joined him with a local trainer named Van “Peanut” Warren. Jackson’s football career began while he was in high school and under coach Rick Swain. Considering his skills on the field, Jackson did not waste time to earn for himself a respectable place in the hearts of football lovers across the nation. Lamar Jackson earned himself Rivals.com’s ratings as Florida’s 4-star prospect and #8 dual-threat quarterback in the nation. He was able to earn this after throwing a total of 31 passing touchdowns and 22 rushing touchdowns. Jackson also became the first student in Boynton Beach student to win the prestigious Lou Groza Awards High School Player of the Year award. After playing for two seasons in the high school, Lamar was offered admission by several Universities like the Florida State, Auburn and South Carolina but he chose to join the University of Louisville in 2015, after being recruited by Lamar Thomas. At the University, the Pompano Beach native was set to make yet another history. As a fresher, Jackson appeared in 12 games with 8 starts but he finished with 12 touchdowns, 8 interceptions, 135-of-247 passes for 1,840 yards and he ran for 960 yards and 11 rushing touchdowns. These mind-blowing statistics earned him the MVP honours at the prestigious 2015 Music City Bow. Jackson made yet another history in his sophomore year when he received a Walter Camp award as the best player of the year. He also won the Maxwell’s Award as the best all-around player in college football. He then crowned it up with the 2016 Heisman Trophy which he received on December 10, 2016. He received this trophy after making at least 21 rushing touchdowns and 30 touchdown passes. This made him the first player from the University to receive such award. The same year, he was announced by Sporting News as the Player of the Year and ACC Offensive Player of the Year. Jackson joined the National Football League’s draft in 2018. He announced on January 5, 2018, that he would be joining the year’s draft. He eventually made it as the Baltimore Ravens selected him with the 32nd overall pick in the 2018 NFL Draft. He then made his first regular appearance on September 9, 2018, in a game against the Buffalo Bills. He finished the matched with 24 passing yards. His first NFL touchdown came in his team’s 24–23 loss against the New Orleans Saints but his very first start was against the Cincinnati Bengals. Jackson’s scouting report says he has a rare and incredible athletic strength with rare arms length. He has a clear field vision, good ball placement, good off-platform throws and timing to lead receivers for yards after the catch. With an impressive mental ability from pre to post snap, Lamar Jackson also has an impressive ability to read a defence. He is tough. In fact, he is as tough as Michael Vic. QB Lamar Jackson during his first career in the NFL. However, the quarterback has some lapses as well. His poor footwork inside the pocket leads to inaccuracy. Looking at his feet on tape, it clearly indicates that he takes snaps from under centre and the standard 3, 5 and 7-step drop backs. Jack also has a thin frame and needs to push his body forward while running so he would be able to generate enough force on the pass. So far, Jackson’s career stats include 2 touchdowns, 56 pass attempt for 415 yards, 3 interceptions thrown with the longest pass play of 74 in 34 completions in the regular season. 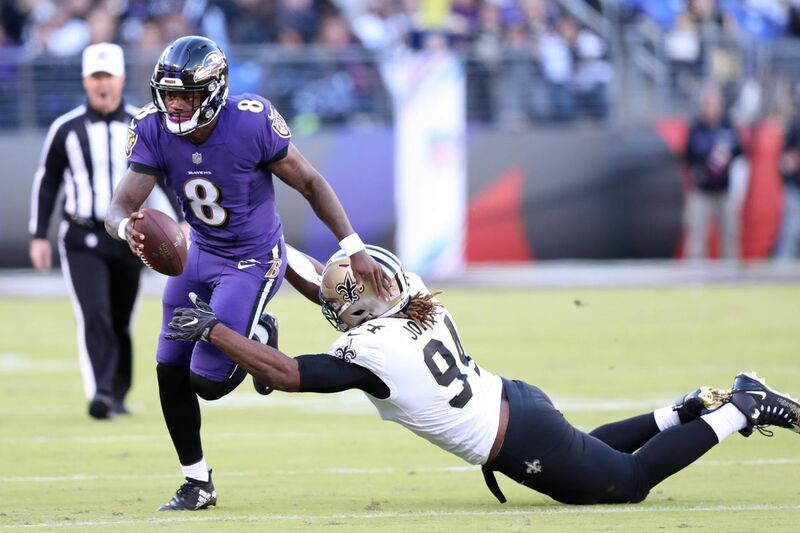 As someone who can single-handedly win games, Baltimore Ravens’ quarterback has an amazing height and body build, thanks to his flexibility on the pitch. He is 6 feet 3 inches tall (1.91 m) while his body weighs 211 lb (96 kg).